Episode 17 – No I DON’T want to build a snowman!!! Also, the Rideau Valley Wildlife Sanctuary is looking for 8″ crocheted or knitted wildlife nests for the orphaned animals that they shelter! You can find the details on our Facebook page complete with the patterns for the nests (the pattern is for 4″ nests but they have requested you enlarge them to 8″ nests) and the address to send them too. Also, check in your area to see if your wildlife sanctuaries would be in need of these nests, or your local Humane Society may need pet blankets and other sorts of things for animals this winter. DOWNTON ABBEY TRIVIA CONTEST!!!! ROUND 3 !! So for Round 3, the process is pretty much the same! All you need to do is be a member of our Ravelry group and click on the link below! It will direct you to Rafflecopter where you can answer this episode’s trivia contest and you can also earn extra entries in the draw by joining up at our other social media sites (it will do it automatically 😉 ) The raffle link will stay active for 1 week and we will draw for the winner and announce their name in the next podcast where we will ask a new question and a new link will be provided, as well as a new prize will be up for grabs! 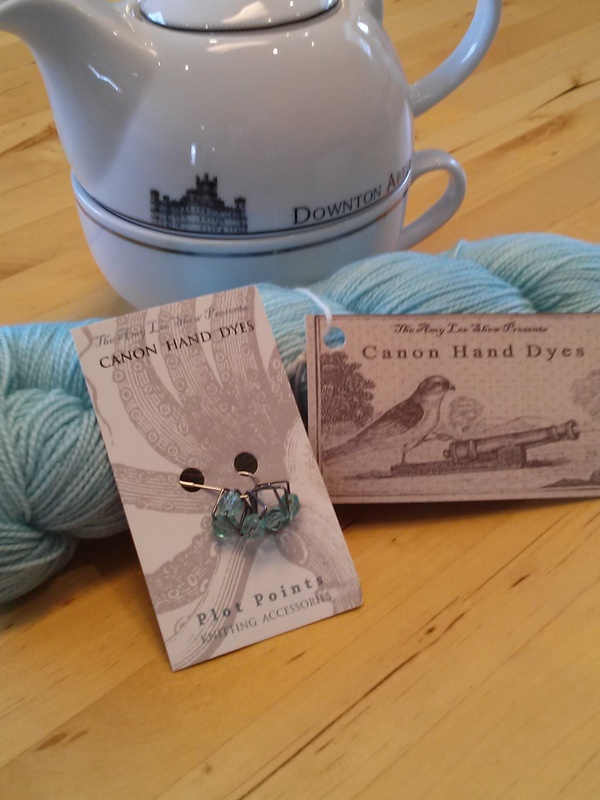 The Prize for this round is a skein of Lady Sybil sock yarn and matching stitch markers from Canon Hand Dyes! and the question is: Who taught Anna to dance the Reel to surprise Mr. Bates? 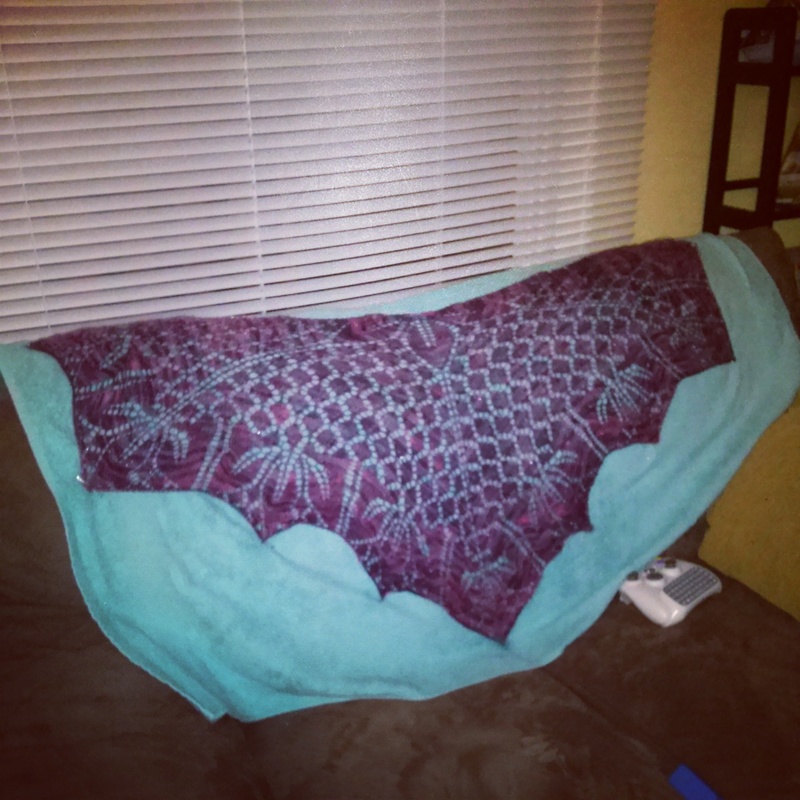 Val is advising that the Crochet Crowd is holding a 2015 Mystery Afghan CAL! Sign up and you receive the first set of instructions February 10th and it goes until May 15th when you have the last day to submit your final photo for a yarn draw 🙂 They are in cooperation with Yarnspirations.com where you can order the kits with crochet hook in different colour sets. She also plans to sign up for it! Go Val! 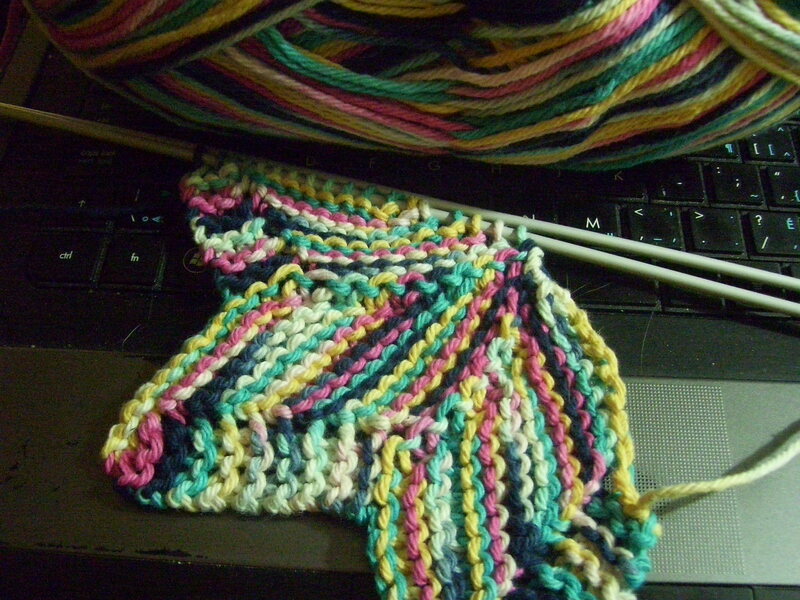 Katy is still working on her Hitchhiker for the never-ending Behmalong with the Knitmore Girls Podcast, and since it’s using rainbow yarn, and double-dipping in KAL/CALs is always fun (and encouraged), she’s also participating in the February Rainbow-a-Long with The Suburban Stitcher Podcast! Val finished her Cabaret cowl and couldn’t be more pleased how it knit up. Forgot to leave yarn at the end to sew up the different ends so she will stitch them together with some blue thread. So cozy and warm! Valerie is working on a Baby star dishcloth in Bernat Handicrafter Cotton in Crysanthemums for a friend down south as well as still working on her Easy Triangle shawl. Katy is working on her Clockwork by Stephen West for her husband using Cascade Heritage sock solids in ‘Mossy Rock’ and ‘Walnut’, her Hitchhiker by Martina Behm using Western Sky Knits Magnolia sock in ‘Rainbow Night’ and her Snowball’s Chance in Hell mitts using KnitPicks Stroll Sport in ‘Mink Heather’ and ‘Rainforest Heather’. 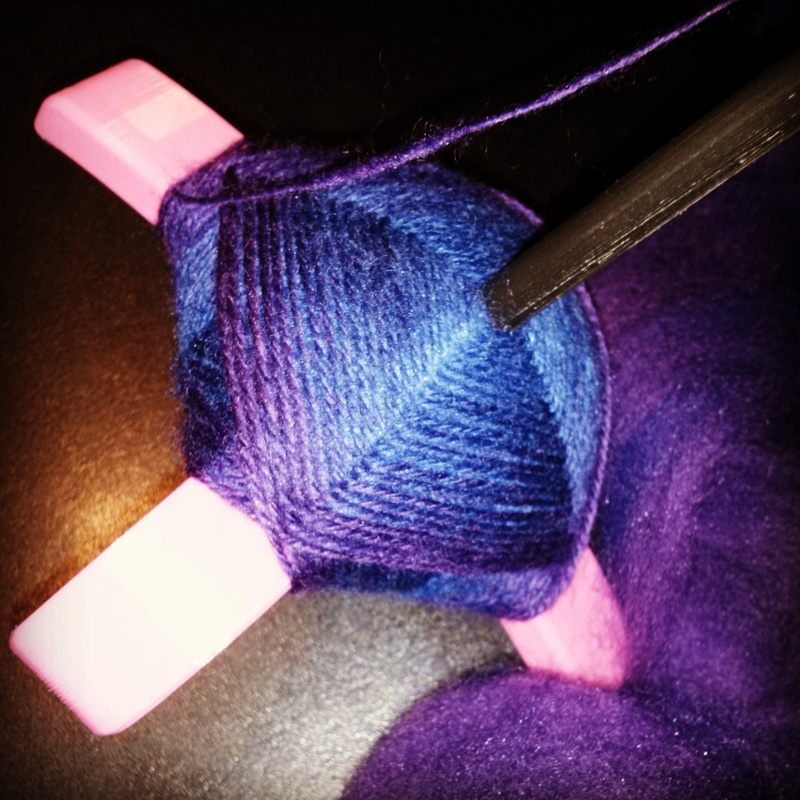 Katy is still working on the ‘Nebula’ braid from Moonrover yarns on her Turtle made Turkish spindle and she’s onto the second colour! Loving it! Katy needs to create a household budget, badly! Val Wants and Needs all the sleep and don’t know why – have to call my doctor about it; maybe my iron or thyroid levels have gone all wonk again. can sleep for 18 hours in the day and still go to sleep at night. Katy and Val both want this cruddy weather to STAAAAAAAAAAHHHHPP!! Too much snow! Yes, we’re Canadian and we should be used to it by now, but enough is enough – it’s colder here than the North Pole as I’m writing the show notes too cold! Katy wants to take pictures like Amanda Jennings, aka heyporkchop on instagram and she is one half of the geniuses behind The Frosted Pumpkin Stitchery and she has a gorgeous blog that is most inspiring to Katy right now! Valerie learned all over again that she can use worsted weight yarn for socks! She remembered that there was a recipe pattern in her Getting Started Knitting Socks book by Ann Budd for using worsted weight yarn – going to try with some red heart super saver – would be cozy socks for around the house. Might be too thick to wear outside with shoes, but still, cozy nonetheless! Katy learned that it is tough everywhere! Trying to find a job in our area of the world is most difficult, but we have to keep reminding ourselves that it actually is tough everywhere! It makes us feel a little bit better knowing we’re not the only ones. Val ordered yarn! 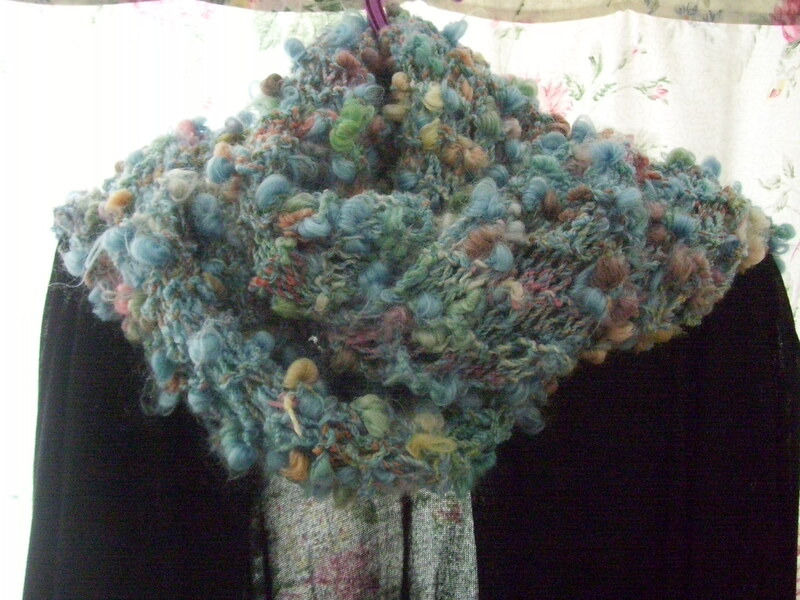 From Willow Yarns (.ca). All things to make socks with – but not telling what colour ways – going to keep it a secret until it all comes in 😉 All prices are in Canadian (yay), shipping is a bit expensive but then so is everything in Canada. Boo. She bought enough yarn for 3 pairs of sock for under $45 Canadian, so it was a fun, affordable shopping trip! Katy finally bit the bullet and bought ‘Zombody Loves Ewe’ from Desert Vista Dyeworks because she had extra bag money and she’s been wanting that colour for a couple years now and didn’t want to wait another year for it to be available. 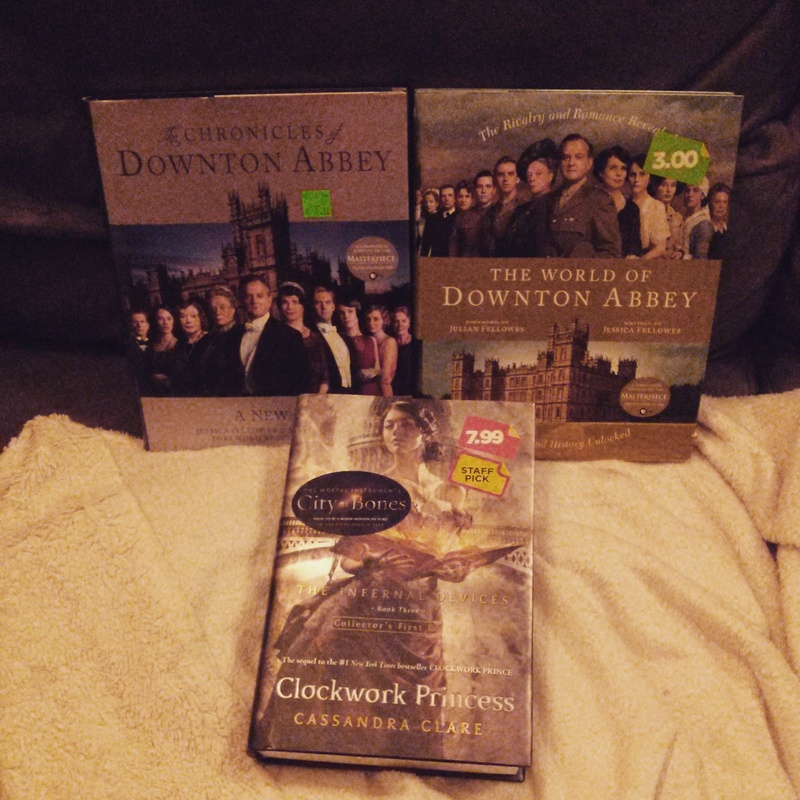 She also got some early Valentine’s presents from her husband; The World of Downton Abbey, The Chronicles of Downton Abbey, and Clockwork Princess by Cassandra Clare! 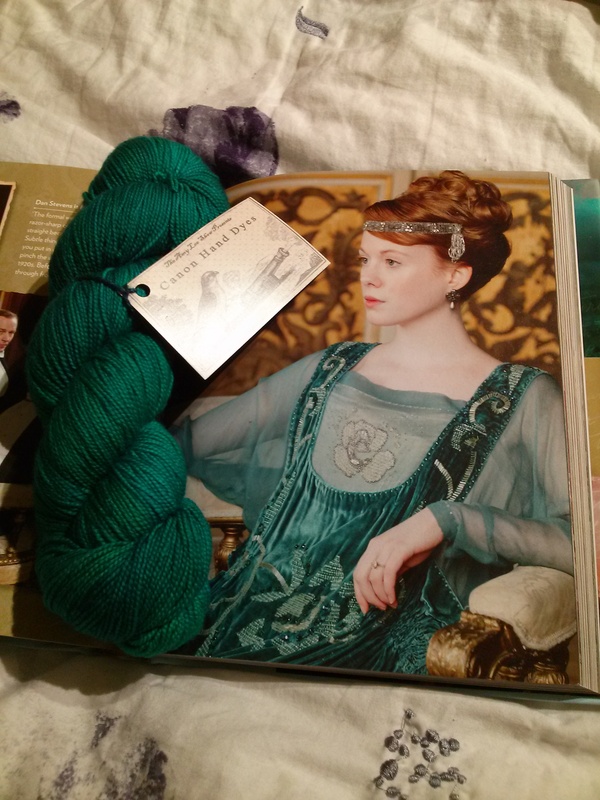 Lots of books for Katy and the pictures in the Downton Books are gorgeous and one picture of Lavinia in particular stuck them both and her dress was the obvious inspiration for the colourway by Canon Hand Dyes (which Lina is about to receive 😉 Lucky). Val found Patons Kroy sock yarn in Rainbow Stripes at Yarninspirations.com for less than $8 a skein – really thinking of buying it if it’s not available at Michael’s. Obviously Val is wanting ALL the sock yarn!!!! Katy found some super pretty Wyld sock yarn at Moonrover yarn in ‘Stalagmite’ and she wants it soooooooo bad! She also learned that Penguin Soup will be having signups for the Firefly Shiny Club March 1-4th on her website! A Firefly inspired yarn club? Yes please!!! And last but certainly not least, Katy checked out Canon Hand Dyes yet again to find that she’s making Jane Austen inspired colourways!!!! Would be perfect for the Sampler Girl Podcast Jane Austen Knit-a-Long! Valerie is reading ‘Divergent’ by Veronica Roth as Katy loaned her the whole series (and Val’s mom finished the whole series in a week!). She’s really enjoying it and plans on reading the others. Katy isn’t reading much, she started Clockwork Angel by Cassandra Clare and is really liking it! That’s it for this episode! We hope you all have a great Valentine’s Day and a wonderful two weeks! Don’t forget to enter our Downton Trivia Contest!!!! Take care, stay warm and knit fast!! !